The tools and techniques of the HeartMath® system are based on decades of scientific research on the psychophysiology of stress, emotions, and the interactions between the heart and brain. While an in-depth knowledge of this research is not necessary to be able to successfully use the emWave system, you may find that a basic understanding of the science behind the system will help enhance your practice and the benefits you derive. For those desiring more detailed information on research topics summarized in these and other sections, links to the Research section of the Institute of HeartMath’s website are provided, where you will find original research papers, scientific monographs, and other relevant material. Most of us have experienced driving our car and knowing it is not running well. This can be due to many factors, one of which could be that the timing is off. This means the spark plugs are not firing in a synchronized manner. The car still runs, just not very well. This is true for our bodies as well. When they are out of sync, they work, just not as well as they could. This means that our autonomic nervous system, hormonal system and immune system are not working in a synchronized manner. We fix our car by adjusting the timing so that the spark plugs fire with the proper order and synchronization. We can re-synchronize our body systems by creating a state of Coherence and thus improving our mental focus, emotional stability and physical resilience. This allows us to operate in a more efficient manner in all areas of life. The diagram below illustrates some physiological patterns before and after inducing a state of Coherence. Physiological entrainment during coherence. The top graphs show an individual’s respiration rhythm, heart rate variability, and blood pressure rhythm (pulse transit time) over a 10-minute period. 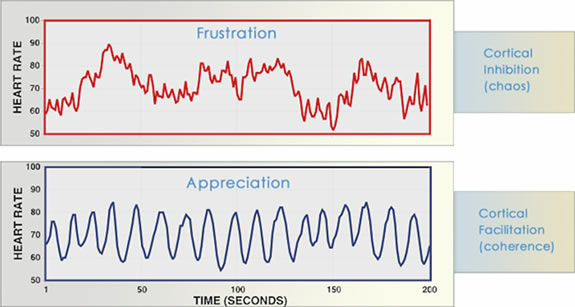 At the 300-second mark (center dashed line), the individual used HeartMath’s Quick Coherence® technique to activate a feeling of appreciation and shift into the coherence state. At this point, the rhythms of all three systems came into entrainment: notice that the rhythmic patterns are harmonious and synchronized with one another instead of scattered and out-of-sync. The Quick Coherence technique, a tool from the HeartMath System, is a simple and effective way to bring your body systems into synchronous operation allowing you to move through life in a state of ease. The heart at rest was once thought to operate much like a metronome, faithfully beating out a regular, steady rhythm. Scientists and physicians now know, however, that this is far from the case. Rather than being monotonously regular, the rhythm of a healthy heart—even under resting conditions—is actually surprisingly irregular, with the time interval between consecutive heartbeats constantly changing. This naturally occurring beat-to-beat variation in heart rate is called heart rate variability (HRV). Heart rate variability is a measure of the beat-to-beat changes in heart rate. This diagram shows three heartbeats recorded on an electrocardiogram (ECG). Note that variation in the time interval between consecutive heartbeats, giving a different heart rate (in beats per minute) for each interbeat interval. The moment-to-moment variations in heart rate are generally overlooked when average heart rate is measured (for example, when your doctor takes your pulse over a certain period of time and calculates that your heart is beating at, say, 70 beats per minute). However, the emWave technology allows you to observe your heart’s changing rhythms in real time. Using your pulse data, it provides a picture of your HRV—plotting the natural increases and decreases in your heart rate occurring on a continual basis. Many factors affect the activity of the ANS, and therefore influence HRV. These include our breathing patterns, physical exercise, and even our thoughts. Research at the Institute of HeartMath has shown that one of the most powerful factors that affects our heart’s changing rhythm is ourfeelings and emotions. When our varying heart rate is plotted over time, the overall shape of the waveform produced is called the heart rhythm pattern. When you use the emWave system or the InnerBalance Trainer, you are seeing your heart rhythm pattern in real time. HeartMath research has found that the emotions we experience directly affect our heart rhythm pattern—and this, in turn, tells us much about how our body is functioning. In general, emotional stress—including emotions such as anger, frustration, and anxiety— gives rise to heart rhythm patterns that appear irregular and erratic: the HRV waveform looks like a series of uneven, jagged peaks (an example is shown in the figure below). Scientists call this an incoherent heart rhythm pattern. Physiologically, this pattern indicates that the signals produced by the two branches of the ANS are out of sync with each other. This can be likened to driving a car with one foot on the gas pedal (the sympathetic nervous system) and the other on the brake (the parasympathetic nervous system) at the same time—this creates a jerky ride, burns more gas, and isn’t great for your car. Likewise, the incoherent patterns of physiological activity associated with stressful emotions can cause our body to operate inefficiently, deplete our energy, and produce extra wear and tear on our whole system. This is especially true if stress and negative emotions are prolonged or experienced often. In contrast, positive emotions send a very different signal throughout our body. When we experience uplifting emotions such as appreciation, joy, care, and love, our heart rhythm pattern becomes highly ordered, looking like a smooth, harmonious wave (an example is shown in the figure below). This is called a coherent heart rhythm pattern. When we are generating a coherent heart rhythm, the activity in the two branches of the ANS is synchronized and the body’s systems operate with increased efficiency and harmony. It’s no wonder that positive emotions feel so good—they actually help our body’s systems synchronize and work better. Heart rhythm patterns during different emotional states.These graphs show examples of real-time heart rate variability patterns (heart rhythms) recorded from the same individual experiencing different emotions. The incoherent heart rhythm pattern shown in the top graph, characterized by its irregular, jagged waveform, is typical of stress and negative emotions such as anger, frustration, and anxiety. The bottom graph shows an example of the coherent heart rhythm pattern that is typically observed when an individual is experiencing a sustained positive emotion, such as appreciation, compassion, or love. The coherent pattern is characterized by its regular, sine-wave-like waveform. It is interesting to note that the overall amount of heart rate variability is actually the same in the two recordings shown above; however, the patterns of the HRV waveforms are clearly different. Physiologically, the coherence state is marked by the development of a smooth, sine-wavelike pattern in the heart rate variability trace. This characteristic pattern, called heart rhythm coherence, is the primary indicator of the psychophysiological coherence state, and is what the emWave system or the InnerBalance Trainer measures and quantifies. A number of important physiological changes occur during coherence. The two branches of the ANS synchronize with one another, and there is an overall shift in autonomic balance toward increased parasympathetic activity. There is also increased physiologicalentrainment—a number of different bodily systems synchronize to the rhythm generated by the heart (see figure on top of this page. Finally, there is increased synchronization between the activity of the heart and brain. Heart rhythm patterns during relaxation and coherence. The two graphs on the left show typical heart rate variability (heart rhythm) patterns during states of relaxation and coherence. To the right are shown the HRV power spectral density plots of the heart rhythm patterns at left. Relaxation produces a high-frequency, low-amplitude heart rhythm, indicating reduced autonomic outflow. Increased power in the high frequency band (.15) of the HRV power spectrum is observed, reflecting increased parasympathetic activity (the “relaxation response”). 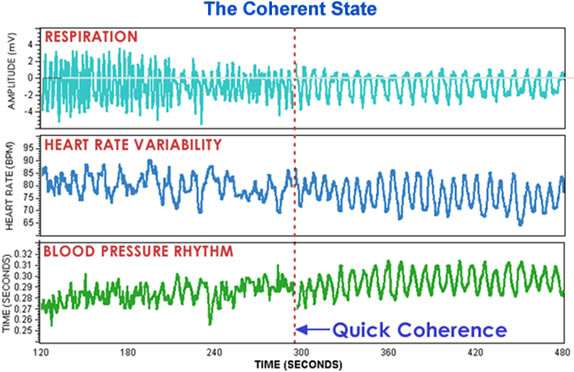 In contrast, the coherence state, activated by sustained positive emotions, is associated with a highly ordered, smooth, sine-wavelike heart rhythm pattern. Not only are there fundamental physiological differences between relaxation and coherence, but the psychological characteristics of these states are also quite different. Relaxation is a low-energy state in which the individual rests both the body and mind, typically disengaging from cognitive and emotional processes. In contrast, coherence generally involves the active engagement of positive emotions. Psychologically, coherence is experienced as a calm, balanced, yet energized and responsive state that is conducive to everyday functioning and interaction, including the performance of tasks requiring mental acuity, focus, problem solving, and decision-making, as well as physical activity and coordination. Another important distinction involves understanding the role of breathing in the generation of coherence and its relationship to the techniques of the HeartMath System. Because breathing patterns modulate the heart’s rhythm, it is possible to generate a coherent heart rhythm simply by breathing slowly and regularly at a 10-second rhythm (5 seconds on the in-breath and 5 seconds on the out-breath). Breathing rhythmically in this fashion can thus be a useful intervention to initiate a shift out of a stressful emotional state and into increased coherence. However, this type of cognitively-directed paced breathing can require considerable mental effort and is difficult for some people to maintain. This is because input generated by the heart’s rhythmic activity is actually one of the main factors that affects our breathing rate and patterns. When the heart’s rhythm shifts into coherence as a result of a positive emotional shift, our breathing rhythm automatically synchronizes with the heart, thereby reinforcing and stabilizing the shift to system-wide coherence. To derive the full benefits of the HeartMath tools, it is therefore important to learn how to self activate and eventually sustain a positive emotion. However, for users who initially have trouble achieving or maintaining coherence, practicing heart-focused breathing at a 10- second rhythm, as described above, can be a useful training aid. Once individuals grow accustomed to generating coherence through rhythmic breathing and become familiar with how this state feels, they can then begin to practice breathing a positive feeling or attitude through the heart area in order to enhance their experience of the HeartMath tools and their benefits. Eventually, with continuity of practice, most people become able to shift into coherence by directly activating a positive emotion. Many of the changes in bodily function that occur during the coherence state revolve around changes in the heart’s pattern of activity. While the heart is certainly a remarkable pump, interestingly, it is only relatively recently in the course of human history—around the past three centuries or so—that the heart’s function has been defined (by Western scientific thought) as only that of pumping blood. Historically, in almost every culture of the world, the heart was ascribed a far more multifaceted role in the human system, being regarded as a source of wisdom, spiritual insight, thought, and emotion. Intriguingly, scientific research over the past several decades has begun to provide evidence that many of these long-surviving associations may well be more than simply metaphorical. These developments have led science to once again revise and expand its understanding of the heart and the role of this amazing organ. The effect of heart activity on brain function has been researched extensively over about the past 40 years. Earlier research mainly examined the effects of heart activity occurring on a very short time scale—over several consecutive heartbeats at maximum. Scientists at the Institute of HeartMath have extended this body of scientific research by looking at how larger-scale patterns of heart activity affect the brain’s functioning. In the september 2014 edition of the Frontiers of Psychology a very interesting article was published. This article reviews sympathetic and parasympathetic influences on the heart, and examines the interpretation of HRV and the association between reduced HRV, risk of disease and mortality, and the loss of regulatory capacity. This article also discusses the intrinsic cardiac nervous system and the heart-brain connection, through which afferent information can influence activity in the subcortical and frontocortical areas, and motor cortex. It also considers new perspectives on the putative underlying physiological mechanisms and properties of the ultra-low-frequency (ULF), very-low-frequency (VLF), low-frequency (LF), and high-frequency (HF) bands. Additionally, it reviews the most common time and frequency domain measurements as well as standardized data collection protocols. In its final section, this article integrates Porges’ polyvagal theory, Thayer and colleagues’ neurovisceral integration model, Lehrer et al.’s resonance frequency model, and the Institute of HeartMath’s coherence model. The authors conclude that a coherent heart is not a metronome because its rhythms are characterized by both complexity and stability over longer time scales. Future research should expand understanding of how the heart and its intrinsic nervous system influence the brain. And last but not least another interesting article which is a must to read for those who want to have an in-depth understanding of Cardiac coherence and self-regulation.